If you have any questions, need advice or help placing an order, call Guilty on 01271 814966, we are here to help you. Guilty Bangles are pleased to offer you a Free Signed For Delivery on all purchases for the UK and Ireland. Your Guilty Bangle or Bracelet will be presented in our bespoke designed Guilty Bangles presentation Padded Box or Satin Pouch. The Isla in large wrist size, a chunky and solid 925 sterling silver, handmade in the UK and exclusive to Guilty! 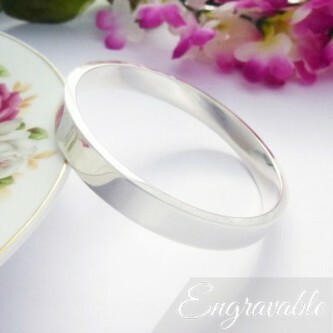 Find a great range of womens large silver bangles for ladies with big wrists. Our range is completely made from solid 925 sterling silver and is designed for women with a slightly larger than normal wrist size where a larger than normal silver bangle is required. At Guilty Bangles, we have listened to our customers and many have asked for a bangle that is bigger than the standard size. We have created an exclusive range of solid silver bangles that are slightly larger than the average size to meet our clients needs. The best method that we have found for measuring a bangle is to compare the internal diameter of one that you own. Just simply measure the inside diameter using a ruler with any in our bigger bangle range. You can always refer to our bangle sizing range for more information so that you buy a solid silver bangle that fits your wrist size. All of our ladies larger silver bangles are made from 925 sterling silver that is solid, exclusively for us by one of the best silversmiths in the country. The quality is second to none and all bangles are handmade and hallmarked in the UK. These solid silver bangles also come with free delivery in the UK as well as bespoke jewellery boxes that are branded with Guilty to protect your bangle for the long term.